Choir members were very sorry to hear of the death of Mrs Margaret Thomas wife of Ifor who was one of the Choir’s founder members and Chairman. Our thoughts are with Ifor and his family. We are also sorry to hear that Noel Morris is back in hospital for the second time in a short period – brysia wella Noel. To crown a very successful year for the choir there is talk of a possible trip to Santander, Spain to take part in two concerts and to set up an Exchange arrangement with some Spanish choirs. The choir gave a positive vote to form a small working party to work out the details of our Spanish trip to Santander. It is likely to be in May next year – We will keep you posted of progress. 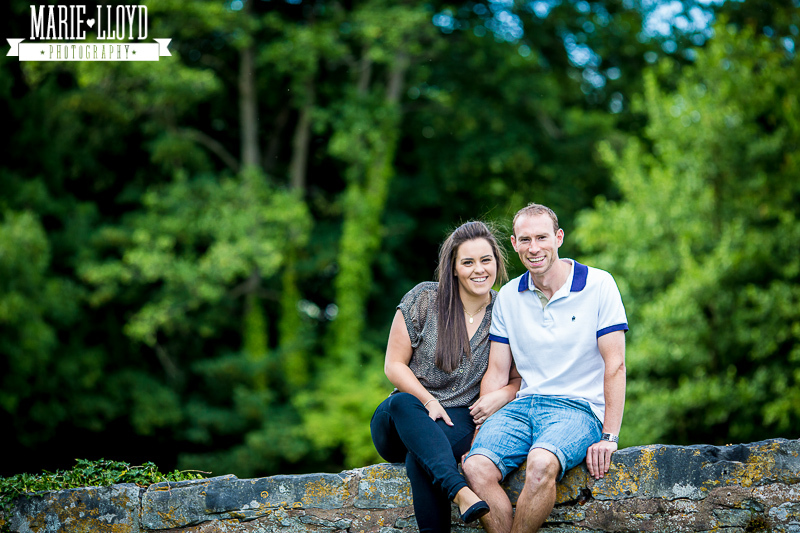 Monday 22nd December – Jade and Bleddyn’s Wedding at St Peters Church Ruthin. 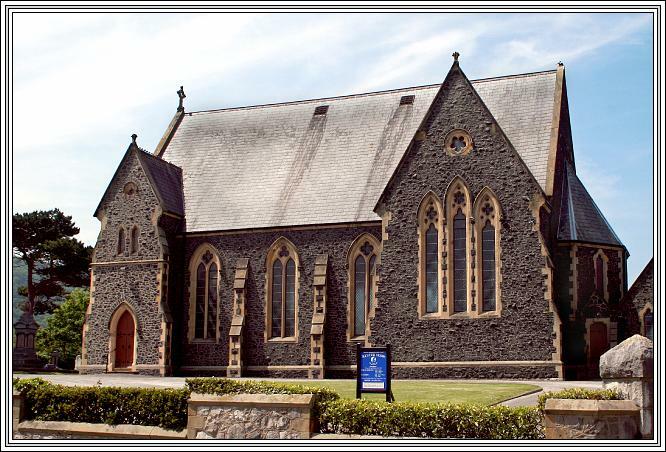 The choir were delighted to accept an invitation to sing at Jade and Bleddyn’s wedding in the beautiful St Peter’s church in Ruthin. The groom is choir member Roger Lewis Jones ‘s nephew and a member of the Lewis family and they have lived in Rhewl for the last year. Bleddyn is a football man and is already involved in Rhewl Football Club like his father, grandfather and great-grandfather before him. The young couple looked stunning in the beautiful surroundings and the choir was delighted to be able to sing in a building with such wonderful acoustics. The Choir is very grateful for their generous donation to the Choirs Charity funds. 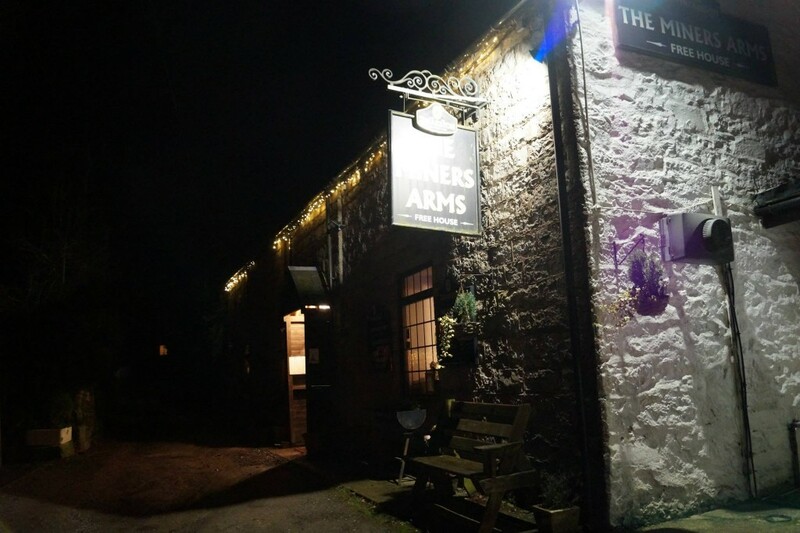 Friday 19th December – An informal Xmas Concert at the Miners Inn at Maeshafn. Quite a few of the choir did not know where Maeshafn was, never mind the Miners Inn. What they discovered was a pretty village with a lovely old fashion tavern. Most of the Choir members were in a festive mood after enjoying their office parties and with Christmas just around the corner. The Choir enjoyed a lovely evening and the rumour is that Bov has shangaied two more unsuspecting locals for the choir. Rhewl School held a festive Christmas Evening in the Pavilion on Wednesday, December 10th. It was a lovely evening beginning with headmistress Sian Hilton welcoming everyone. Entertainment was provided by pupils of the School, the Denbighshire Training Band, Denbighshire County Band and the Porthmyn Choir. Mr John Powell the charismatic leader of the two bands introduced the choirs explaining that the Training Band playing that evening drew on pupils from six local Primary Schools whilst the County Band drew members from further affield and where one of the best bands in the UK doing extremely well in Competitions all over the country. The Choir would like to congratulate John and Heather Powell for the excellent work that the do for music in the region and of course the members of the two bands for providing such an excellent show..
Every year the Committees of Derwen Show and the Clawddnewydd & Clocaenog Sports hold a Xmas party for the Senior Citizens of those villages in Canolfan Cae Cymro. The choir were invited to provide the entertainment following the meal and they thoroughly enjoyed singing to an appreciative audience and also in the excellent acoustics of the Hall. The choir gave a debut rendition of the song – ‘I will walk a thousand miles’ and it seemed to go O.K. The Committees provided an excellent meal after the concert and the night was finished with a tremendous night in the Glan Llyn for most of the choir. Update on Rebecca’s new career. Mrs Nia Cutmore attended the Choir practice on Tuesday Nov 19th to provide an update on her daughter’s new career with YWAM- Next Wave Training Ship School. The Choir were delighted last year to be able help Rebecca with part of the fees for her maiden voyage. 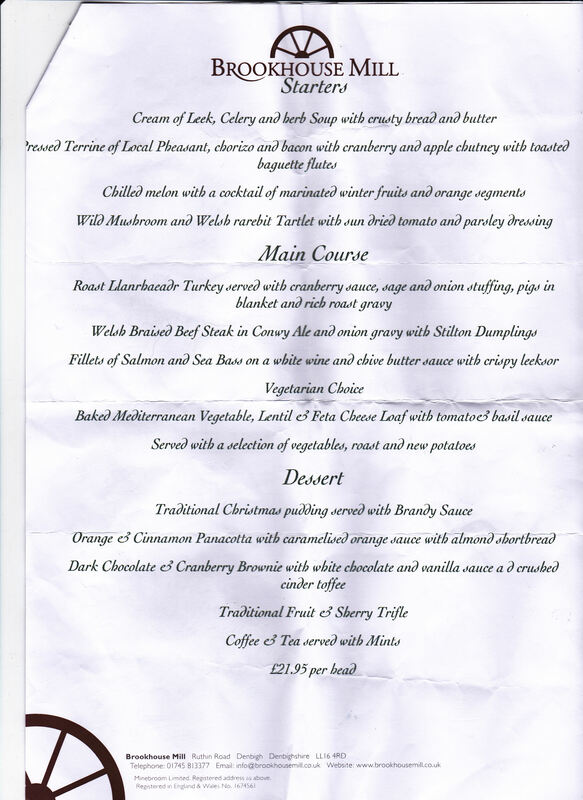 Over 70 people attended the Choir’s Xmas Party at the Brookhouse Mill on November 28th; it was a very enjoyable evening with first class food and service; also Llangynhafal’s John Sellars was at his sparkling best. Many thanks to Mike Denman for organising the event. 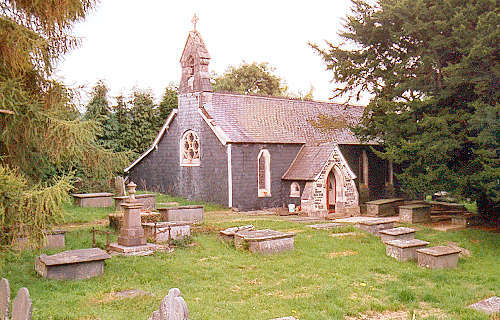 18th October – St James Church Nantglyn Practically the whole of the choir had no idea where the church was in Nantglyn and were surprised to find the church right in the middle of the village next to the bridge crossing the River Lliwen. 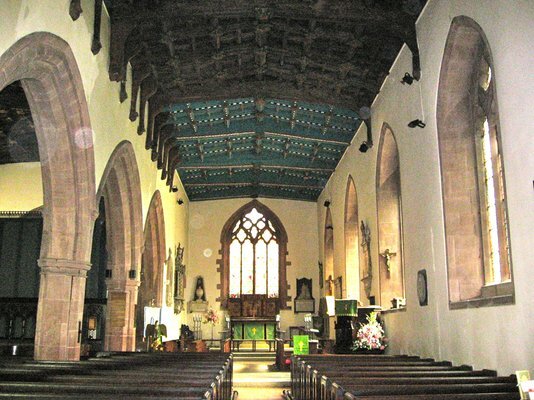 There has been a church on this site for over 700 years and the current beautiful building was partly rebuilt in 1777 and was almost totally rebuilt in 1862. Outside the door of the church is a giant yew tree in which there are steps leading to a pulpit said to have been used by John Wesley. The Choir thoroughly enjoyed the concert held in the Church, with Bov starring as Jon Bon Jovi (possibly more like a Topol) in “Let it Rain”. After the concert the choir and the audience enjoyed a nice sociable ‘Cheese and Wine’ evening in the Church Hall across the road to the Church. The local WI invited the choir to sing at the beautifully refurbished Broughton Church situated just across the road to the Airbus factory. Only half the choir were able to turn out due to illness, holidays and other commitments – however the voices were well balanced and Eirlys, Merfyn and JT were at their sparkling best. 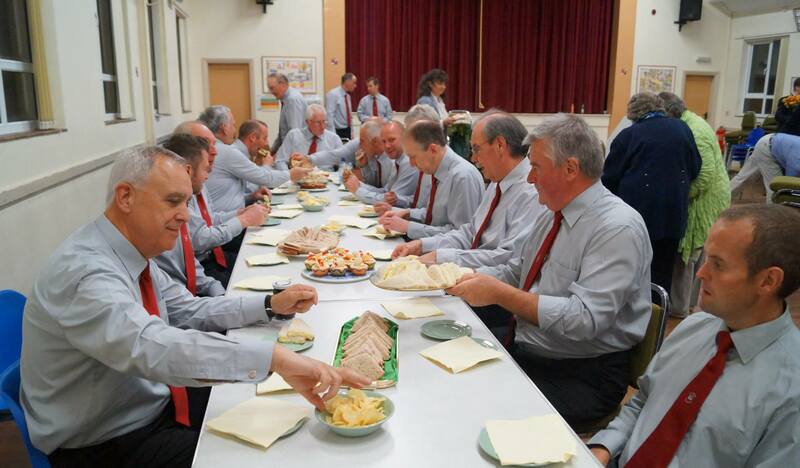 The choir now look forward to any WI, Chapel or ‘Merched y Wawr’ functions as we know that the suppers provided are always excellent and Broughton was no exception. 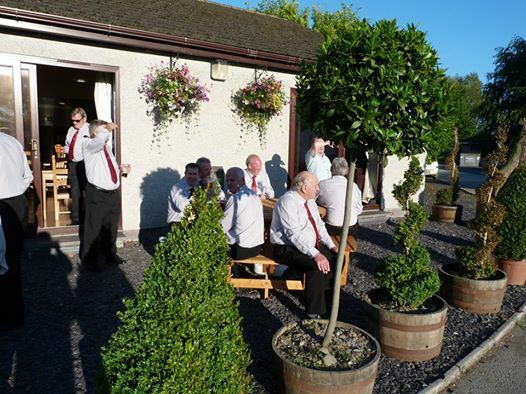 October 4th – Denbigh Buffaloes at the Plas Pigot The choir was delighted to be asked back again to the Plas Pigot, Denbigh to help the Vale Lodge of the Royal Antediluvian Order of Buffaloes to raise funds for the “We are Macmillan – Cancer Support” and the Marie Currie charities. The evening was organised by Stephen Beach who is the current mayor of Ruthin. 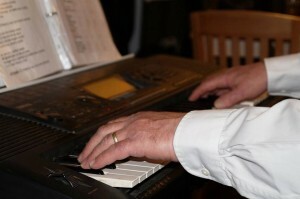 Another Ruthin Councillor – Geraint Woolford had a solo spot in the Concert. The choir were tickled with the description of the choir on the event poster. Roedd y côr wedi plesio i gael gwahoddiad i ganu yn Betws yn Rhos – ardal gyda Chôr Meibion enwog ei hunan. Roedd y noson yn cael ei chynnal gan Gymdeithas Capel Hyfrydle i agor eu tymor gaeaf a chafodd y côr noson hyfryd yn ei chwmni. Rhaid diolch i ferched y capel am y swper bendigedig. 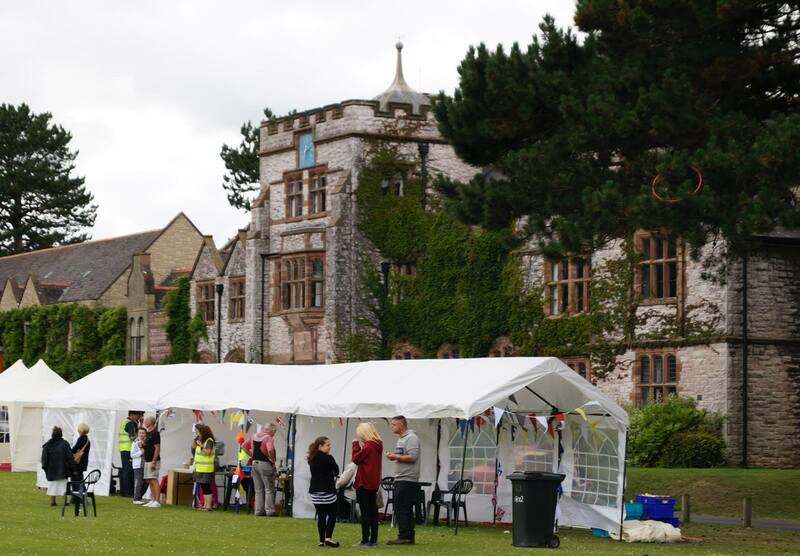 The choir were invited to take part in the Rhewl Gardening Club’s Food Festival for the 2nd succesive year and enjoyed a very pleasant evening – from all accounts the choir were on form singing on their home patch. The Choir were pleased to support the Ruthin Forward group in singing at the Ruthin Carnival held at Ruthin School on August 16th. Many of the choir had attended Ysgol Brynhyfryd across the A494 during their school days and it did feel rather strange to be singing from the other side of the ‘educational fence’. July 27th Kaley and Iestyn’s Wedding in Llanbedr. 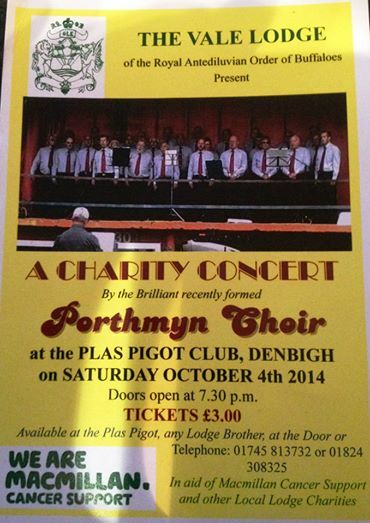 Iestyn bought this ticket for a ‘Session with the Choir’ at an Auction-of-Promises in Rhewl to raise local funds for the Denbigh National Eisteddfod. And true to their word the choir turned up at his wedding, to the lovely Kaley, at Llanbedr church to sing a number of songs in celebration of this lovely occasion. And fair play to Iestyn – he had put some money behind the bar the Griffin to enable the choir to toast the young couple in the traditional way. 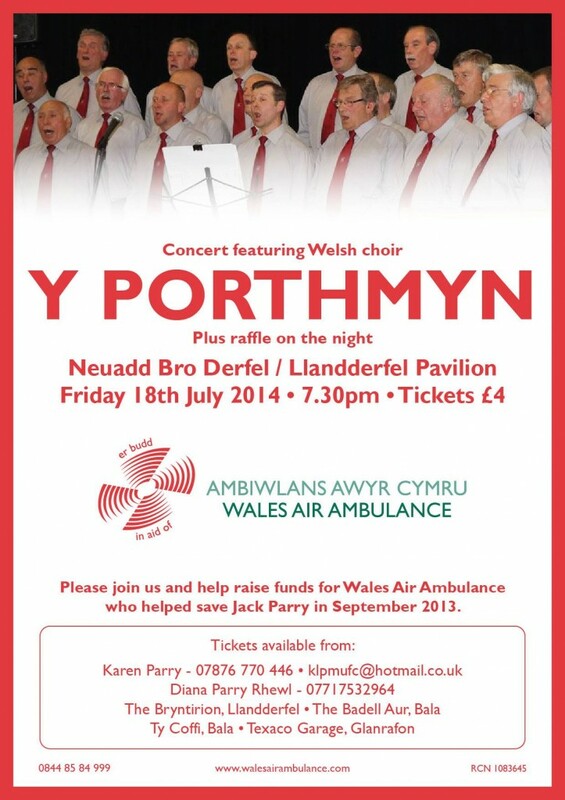 June 14th Springs Caravan Park, St Asaph – This concert was organised by Mr Dennis Williams, Cefnmeiriadog to raise funds for the St Kentigern Hospice; the Springs Caravan Park Clubhouse had excellent acoustics and the Choir had the perfect opportunity of singing, for the first time publicly, Bov’s new arrangement of the old Welsh favourite Calon Lan with Eirlys leading. April 26th Saturday – Concert in Pwllglas Village Hall to raise funds for the charity – “Against Breast Cancer”. 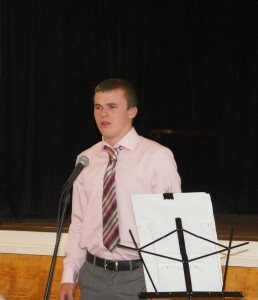 The Guest Artists were the local young talent – Sion Eilir, Elan and Erin Meirion. The Choir and their guests artistes attracted a capacity audience for this concert. 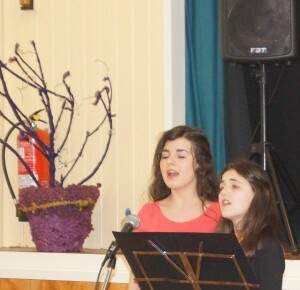 The concert was organised by Catherine Tudor and her family; she had run in the recent London Marathon to raise funds for the Charity and she was delighted to announce that a profit of over £750 was made on the night and that the total she and her friends had achieved was now over £5000. 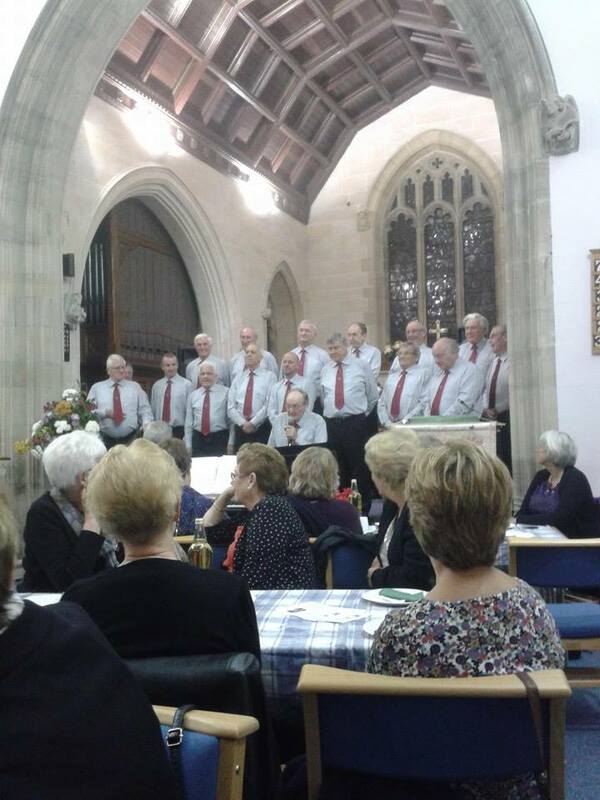 April 21st, 2014 – Easter Bank Holiday Monday evening Capel Soar Nercwys – the choir was delighted to be invited to sing at the annual Easter concert in Capel Soar, Nercwys. The chapel had been refurbished beautifully and the proceeds of this concert went towards this work. The large audience were generous with their applause and the choir thoroughly enjoyed the concert as well as the excellent supper, and later on, the liquid refreshments at the Butchers. Following this evening Bov now knows what he wants for Xmas – a satnav. Diolch yn fawr iawn am y croeso, grandawiad ag y cyfraniad hael tuag at costau y côr. Mawrth 28th, 2014 Mwynhawyd noson fendigedig yn Gapel Pentrecelyn – roedd dros cant yn y gynulleidfa i wrando ar y côr. Dewi Jones oedd Arweinydd y noson ac yn amlwg wrth ei fodd yn ei gapel lleol. Trefnwyd y noson i godi arian i’r elusen CLIC Sargent (plant gyda cancr). Roedd merched y Capel a’i ffrindiau wedi paratoi swper swmpus i’r côr – (deg allan o ddeg). 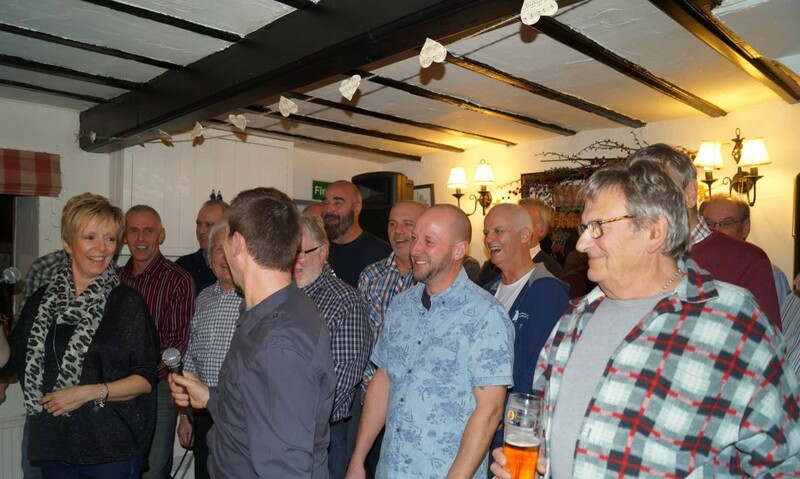 March 1st , 2014 – the choir took part in a Charity St David’s Evening at the Conservative Club Ruthin which happened to be the location of the choir’s debut concert 3 years earlier. 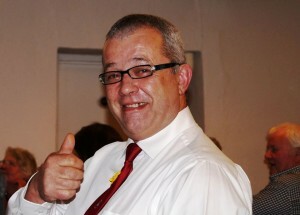 Geraint Woolford was the MC for the evening and was obviously at ease on his home patch. 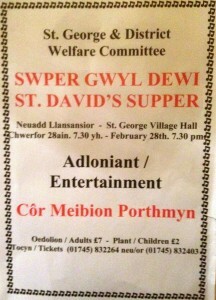 The choir sang at St George & District Welfare Committee’s St. David’s Supper held at the Village Hall. a very enjoyable evening was enjoyed by the choir and by the audience in a packed Hall. John Kerfoot took over the reins of the MC in the village of his youth and was in fine form. The choir were very grateful to the local ladies for the supper they provided. John K preparing for his stint as M.C. with advice from Evan and Tudor R.
The choir was very sorry to hear about Gwynfor Jones being taken to hospital with heart problems. His daughter Amanda reported to the Choir at their practice that Gwynfor had had an operation at Broadgreen Hospital, Liverpool and that it was a success. She also stated that she had stayed at the Patients Relations Accomodation; a cause that the choir helped to raise funds for at John Price’s Clawddnewydd concert in 2012. 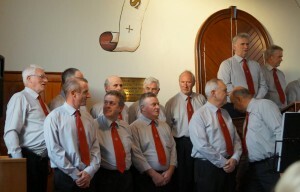 The choir are delighted to learn that the Gwynfor has been able to return home to convalesce.